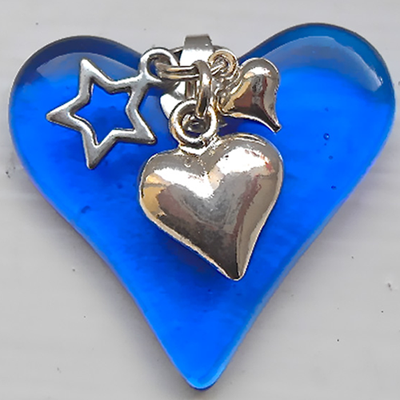 A bright Sky Blue heart shaped pendant with two plated silver hearts and a small star. It measures 3.5cm x 3.5cm and is made of two layers of glass. A layer of clear glass topped with a layer of translucent Sky Blue glass fused together. The larger silver plated heart is 1.2cm x 1.2cm, the smaller heart is 0.6cm x 0.6cm and the star is 1cm x 1cm. It has a Sterling Silver bail and comes with 16" x 1mm Sterling Silver snake chain in a Black or Silver card gift box.